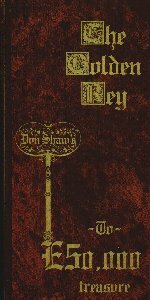 The Golden Key was originally published on in 1982 and was written by Don Shaw, who later wrote Conundrum. The hunt failed (see below) but was later re-launched in a new guise. The Golden Key and its publishers are not, in any way, connected to the club. As of December 2007, some members have reported that the publishers of The Golden Key are not responding to communications from readers. The club suggests you confirm you are able to contact the publishers directly before purchasing an entry pack from them. Similarly, athough the publiched has some exclusive offers for club members, The Golden Key is not officially sponsored by the club. In 2004, the current owner of the rights, Gordon Hooke announced his plans to relaunch the hunt with up to thirteen of his own original additional clues which lead to a new location and a totally new prize. The new hunt is based around a website at www.goldenkey.org.uk. The site will include Drake's The World Encompassed which will form the basis of the new clues. It will no longer be necessary to go outdoors to claim the new prize. According to Hooke, the prize will be a guaranteed £50,000 and all profits from the sales of the £5.95 competition entry pack - which is needed to formally claim any prize - will feed the prize fund and he hopes it to grow to £500,000! Further details, were oublished in the July 2004 issue of the club newsletter. Further details can be obtained from www.goldenkey.org.uk or from The Golden Key Trasure Hunt, 23 Kiln Gardens, Hartley Wintney, RG37 8RG. Although it will incorporate the original book by Don Shaw, the new hunt has no other association with Don. The original book, in the style of a sixteenth century mariner's journal promised a golden key buried somewhere in the UK, the finder of which could claim £50,000 deposited in a Yorkshire Building Society Golden Key account. After 5 years without a successful claim based on the original book, it was announced in the press that the hunt had been cancelled and the right had been acquired by Heritage Books Ltd. But Heritage Books was dissolved in June 1993. The author, Don Shaw, later announced that the rights were now in the hands of Gordon Hooke, who subsequently confirmed that the key was no longer buried and the hunt was 'on hold' pending the relaunch.